Hawaii's character and economy are closely linked to the land, which is crucial to agriculture, tourism, and community identity. But much of Hawaii's produce is imported from the mainland at high cost, and the state's farmers are an aging population. 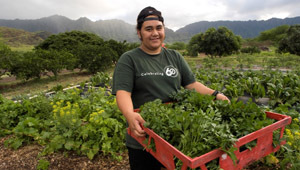 The nonprofit MA'O Organic Farm in rural Lualualei Valley on O'ahu provides tasty vegetables to local consumers while also offering career direction and leadership training to Oahu's youth. The interns, most of them fresh out of Wai'anae's rough-and-tumble high schools, work the farm three days a week while attending community college. In 2007-2008, TPL helped the farm expand by purchasing an 11-acre chicken farm next door. In 2010, TPL assisted the farm again, adding an additional 7.5 acres, making MA'O farm the largest organic farm in the State of Hawai'i. The additional land will help the farm increase its output of organic produce and expand its educational program. In November 2011, First Lady Michelle Obama toured the farm as part of her Let's Move! program, highlighting it as a successful model for increasing awareness of—and access to—healthy eating options. Read more about her visit.